Food allergies change everything, even beloved family recipes you've always taken for granted. It's no secret that food is something that creates happy family memories and traditions. But what do you do when life-threatening food allergies remove a family favorite from your holiday routine? A few years ago, I entered the Chicago Tribune Holiday Cookie Contest and became a semi-finalist. Part 1 of the contest was submitting an essay to the editors, which I've included here. Part 2 was a cookie sampling, which sadly, I did not win. I think my cookie may have been too simple for them--the winning cookies seemed to have about 25 ingredients each. I know the recipe rocks and that's why I'm including it at the end of the essay. One thing that food allergies forces us to do is become creative and make up our own holiday traditions. I hope you enjoy my story and will share your own "recipe re-dos" for your own family faves. As a child, my favorite Christmas cookie, bar none, was made by my beloved Irish grandmother, Mary, who passed away in 1989. 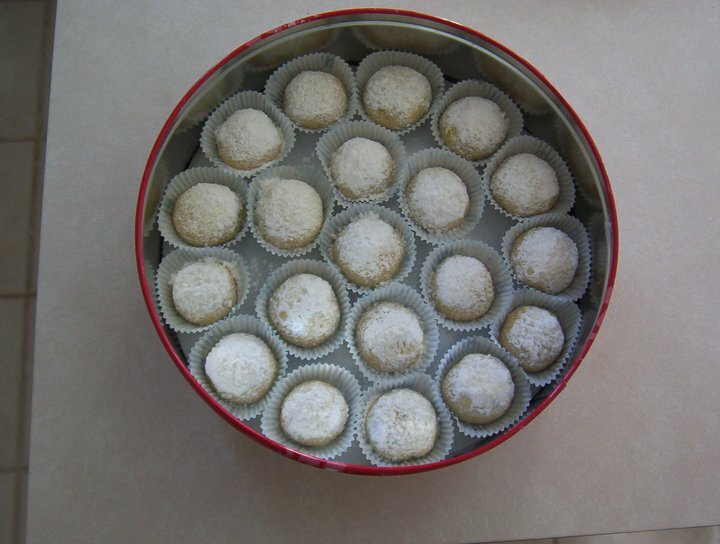 She called them “Pecan Balls” and these small round cookies were delicious: buttery, nutty, rich and covered in lots of powdered sugar. As a lanky child with an enormous appetite for cookies, I could put away 10 at time. In my mind, I dubbed them “Snowballs” because of their round shape and white sugary coating. The cookies kept well, so my busy grandmother made them about a week in advance of the holiday. Unfortunately for her, I snuck into the shiny Christmas cookie tins and helped myself after school, before bed, whenever nobody was looking. As holiday season rolled around each year, the mere fragrance of these cookies as they baked in the oven immediately called to mind family celebrations, gift-giving and good food. Now I’m a mother of two young children and I love to bake. Of course I was anxious to try these cookies out on my daughters. However, when my oldest daughter was diagnosed with a severe allergy to nuts, the “Snowball” tradition looked in danger of disappearing. Obviously pecans were out of the question and I wondered where on earth I would find a nut-free version of this beloved holiday treat. Help arrived in the form of divine intervention. My mother-in-law (who incidentally is Polish) gives each new bride (or groom) a copy of a wonderful Greek Orthodox Church cookbook first published in 1950. One day while flipping through this book, I came across a cookie that sounded very similar to “Pecan Balls”—without the nuts. I was surprised since Greek desserts almost always contain nuts, but this cookie looked promising. Called “Kourabiethes,” the cookie is ball shaped, buttery and rich with a hint of orange. The warm cookies are then covered in powdered sugar. After tinkering with the recipe a bit, I baked my version of “Snowballs” for a family Christmas party and everybody went (okay, I’ll say it) “nuts” for them. A new tradition was born out of necessity. But isn’t that the way most enduring recipes are created? Preheat oven to 350 degrees. Using a standing mixer, beat softened butter until very light and fluffy. Add powdered sugar, egg yolk, vanilla and orange juice, beating thoroughly after each addition. Add flour a little at a time until soft dough is formed that can be handled easily. Taking about a teaspoonful at a time, (I use a small ice-cream scoop) roll into a small ball. Place on a non-stick cookie sheet and bake for 15-20 minutes. Roll in powdered sugar while still hot, then sprinkle liberally with powdered sugar when cool. my kids this holiday season!!! !